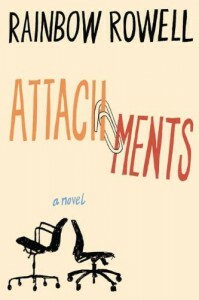 Attachments is narrated by a mix of the emails sent between Beth and Jennifer and Lincoln’s third person point of view, allowing the reader to understand the reasons behind why Lincoln continued to read these exchanges – we are just as charmed by these ladies as Lincoln is and want him to keep reading about them so that we can keep reading about them too. Lincoln is sweet, sensitive and quiet, yet still completely believable. He falls in love completely, honestly, and for the right reasons, baring his soul and leaving himself vulnerable. He has his flaws – namely his lack of confidence, indecisiveness, and passive nature – which are instrumental in his growth and development throughout the course of the novel. If I showed anyone my email inbox right now, some of the subject titles – not to mention the content – would lead to questioning looks. “This is nice harassment, really. :D ” and “seriously though, did they /have/ to give him a shirt?” are just two of the many lovely emails that my best friend and I sent back and forth before realizing that Facebook chat might be an easier communication method (and less likely to provide any of the cute guys we talked about with reasons to get a restraining order). We would send each other stories of epic proportions while away at different universities, and I quickly learned not to read her messages during a lecture if I didn’t want the students around me to glare while I laughed uncontrollably. Suffice to say, Beth and Jennifer’s friendship reminded me so much of my own, which certainly added to its charm and realism. Beth and Jennifer are confident, supportive, caring, hilarious and snarky, and I sincerely hope that everyone is able to have a friendship like theirs at some point in their lives. Attachments is a more than a character-driven romantic comedy; it’s a brilliant and meaningful experience that perfectly captures what relationships are all about.